So, this whole college adjusting to college thing is a lot harder to handle what Tyler and I thought it would be, and yes the blog will take a hit from it. We will no longer be posting reviews for the summer season n here. BUT what we will do is tweet and tumble about the anime we are watching, and then at the end of the summer season we will write up a recap and announce the 2 shows we will review for the fall season. We will start regular posting in the fall! So! 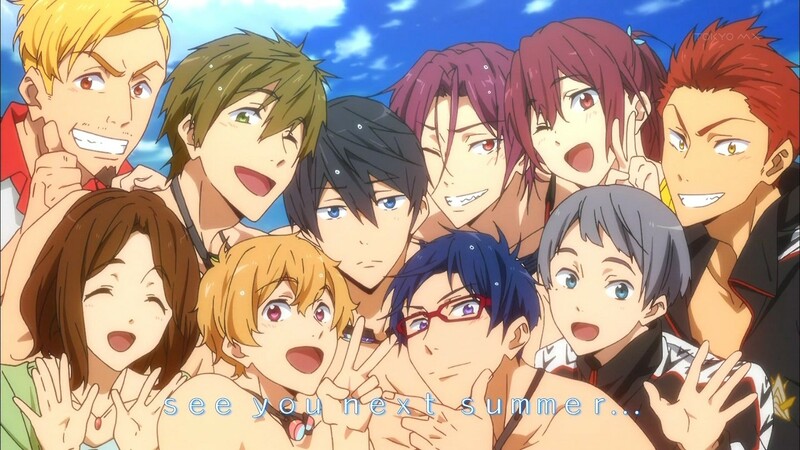 What anime series are you looking forward to watching this fall?? Crop circles, snacks, and stealth: It’s a new episode of Silver Spoon! 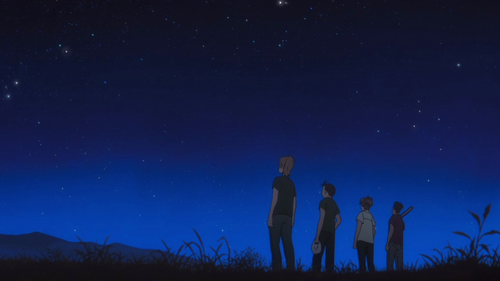 The episode leads off with Hachi and Keiji running through a field and then being approached by a lot of lights over the horizon. Time then rewinds to earlier that day, when the group all sees a giant crop circle in one of the fields. When they get back to the school, they all circle around a computer and fight about what it might be. Meanwhile, Keiji gets a call that “it” is going to be in “area 51” at 9pm that night. They then begin to formulate a plan to go out in see it, a plan that runs into hitch after hitch. They get spotted while sneaking out, but manage to get away into the forest. One by one the group dwindles down, be it from strawberry thieves, ripped pants, or policemen with dogs. Eventually they get to “Area 51”, which is in the middle of the field. Lights show up (this is the same scene from the beginning), and it turns out, to Hachi’s surprise, to be a tractor. As it turns out, Keiji and everybody else knew what it was. This was a very good episode, and the tension was kept high, even though it obviously wasn’t aliens. :b We’re really excited to see where this show is going to go! Episode 4 of SxS might as well be called the Hasabe and Lucy shipping episode. Chihaya declares herself Hasabe’s rival, and keeps warning Lucy to be on the look out for his real intentions. As the day goes on, the group meets the section leader, who comes to work as a remote control rabbit. After being chastised by everyone, he suggests they all go out drinking together. The episode ends with Lucy being drunk, and Hasabe taking her home. Where this will take us, nobody knows. Now getting back to Harvest Moo….I mean….Silver Spoon. First, we learn about pigs. Then about Ban’ei races. Hachiken still has the feels for Ali, and tensions get a little hot with Ichirou. Also! You meet some of Ali’s family, learn a little about being a vet, and learn some more about Ichirou. That’s about where episode 3 ends. Episode 4 starts out with Hachiken getting the top test results in his class. He then proceeds to find a brick oven, and gets everybody in the mood for fresh pizza, something they’ve apparently gone without their entire lives. He then goes about collecting the ingredients, a journey that has several humorous twists. He ends up needing the help of a lot of people, so he has to make a lot of pizzas. Of course, it all ends well, and the pizza is delicious. Even the teachers love it. So! There has been a lack of reviews from the past week, which Tyler and I are sorry about. This week was Tyler’s last week of his summer job, and I had a lot of overtime this week. So, we weren’t able to watch that much anime.We were also getting ready of Tokyo in Tulsa which was a BLAST! We met up with some pretty awesome people and did our favorite thing, talk about anime. Maybe there is A-Kon in our future ? Ay? Tyler and I are also getting ready for college to start up again. So our lives will be full of packing and buying expensive textbooks for the next two weeks. We both go off different weeks so you will see post only by me or him so we don’t get behind again. August will just be an interesting month of an adjustment for both of us! Just to catch up right now, we are going to post all of our reviews for the past week in one big post! They will be not as detailed and shorten, but this will make it easier for us to write and for you to read!